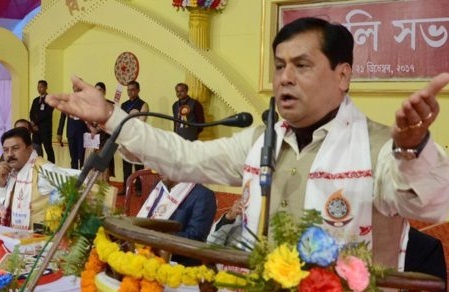 Assam Chief Minister Sarbananda Sonowal on Saturday said the youths of the region will have to play a proactive role to transform Northeast as an example of growth and prosperity. Speaking at Gyan Sangam, a convention of Intellectual Forum of North East at Birinchi Kumar Baruah Auditorium in Gauhati University Sonowal said the new generation writers, intellectuals should work in tandem to reflect the unique culture, convention and traditions of the region to the world. Sonowal said new generation writers should be in a position to project Northeast at the global stage using literature as a tool. Urging the youths to embrace a scientific mentality, he asked them to dedicate themselves to expedite the development of the state. He asked the youths of the region to work dedicatedly for the development of the immense resources of the region and portray Northeast outside the country as region full of potentials, prosperities and possibilities. If this is done the right picture of the region can be portrayed worldwide. The convention was inaugurated by the Vice Chancellor of Gauhati University Prof Mridul Hazarika. Women and Child Development Minister of Madhya Pradesh Archana Tiknis, Dr Krishna Gopal, Dr Nanda Kumar and a host of dignitaries were present on the occasion.